Citation: Ilich M. On the use of geological exploration data in mineral projects. J Environ Geol. 2018;2(2):61-3. The issue of this paper is considered briefly; its detailed consideration (including appropriate facts, analyses, discussions and views) is given in previous papers [1,2]. The author's view, presented in the paper, is based on his personal experience from Serbia [and former Yugoslavia] and other countries as well as on literature data including the extant Serbian and international [The CRIRSCO Template , The PERC Reporting Standard  and UN Framework Classification  regulations and standards. The view is presented diagrammatically in Figure 1. It should be noted that the author's consideration in this paper is focused to the exploration phase of mineral projects, its stages, acts and results while the development phase, its stages, acts and results are just listed – they should be considered in extenso in special papers. As it is mentioned in the previous section, mineral (mining) projects should be performed gradually in two phases: exploration phase and development phase and seven succeeding stages: reconnaissance, prospecting, general exploration and detailed exploration stages of the exploration phase and mine design, mine construction and mine production stages of the development phase. • Project investor(s) could consider the results of every stage of the exploration phase timely and decide whether to continue funding of the project or not. It is also noteworthy that, as for active mines, special geological studies and the accompanying exploratory acts are carried out by the mines' geological services. However, they belong to the development stage and are not connected with the geological studies and the belonging acts of the exploration phase of mineral projects. Any mineral project should be founded on a proper exploration plan accompanied by the corresponding programme and should be performed efficiently in the course of the prospecting, general exploration and detailed exploration stages of the exploration phase. The plan should contain a clear presentation of the project objectives (in the first place of the opted mining method: underground, opencast or combined), of proposed exploration methods (geological, geophysical, geochemical) and of exploratory workings: of their kind (ditches,canels, boreholes, test-pits, shaft wells, adits, etc. ), number, position and spacing as well of the accompanying sampling and the following sample testing, and of the expected results. Finally, any plan must contain a special section or a study regarding the impact of planned exploration workings and acts on environment including health, social and safety issues and how to mitigate harmful effects by predicted efficient protective measures. All planned activities should be carried out timely, according to the accepted schedule. Depending on the results obtained in the aforementioned stages of the exploration phase, an exploration plan could be either generally kept, more or less modified (adjusted to a new data), or substituted by a new, fitting plan. The first stage of the exploration phase of mineral projects engaged in reconnaissance - a regional scale geological (mainly minerogenetic) analysis, aimed at the identification of areas of increased mineral potential and promising for further exploration towards identification of mineral deposits. The reconnaissance is based on selected data and information of earlier regional geological mapping, of various geological, geophysical and geochemical studies, of remote sensing and of rare field check-ups as well as on geological extrapolations, analogies and speculative assumptions. At the end of the stage the results of the analysis are summarized by a competent person and presented in the appropriate geological (reconnaissance) study. The accuracy and confidence of the data and information used in the study, which are not results of direct measurement but gathered from different sources, are debatable. Hence, quantity (tonnage) and quality (grade) of an identified but still unexplored mineral deposit can't be expressed numerically and assigned to any class but is treated in general as exploration results. The study serves as a key document to an investor (or investors) to decide to provide (or not provide) fund for the next stage of the project: the prospecting stage. The stage of the exploration phase of mineral projects engaged in prospecting ‒ a process aimed at the primary outlining of a deposit, identified by reconnaissance, with a loose network of exploratory workings and accompanying samples. During this stage is obtained prime data about basic characteristics (including their variations) of the identified deposit (its dimensions, shape, depth, strike and dip, internal structure, mineral and chemical compositions and density) and about quantity and quality (i.e. inferred mineral resource) of the belonging raw material. The results achieved during this stage are analyzed and presented by a competent person (or persons): in the geological (prospecting) study and in the following technical-economic (scoping) study. The main objective of the geological study is estimation and delineation of an inferred mineral resource, according to the geological data obtained in the prospecting stage. The study should demonstrate that, by further exploration, the inferred resource could be promoted to the indicated resource. The main objective of the scoping study is to indicate potential mineability of the inferred resource by considering modifying factors by a competent person (s) and to show that progress to pre-fesibility study could be made by further exploration. The levels of the accuracy and confidence of the data available are rather low. As for the resulting scoping study the accuracy level, expressed by the permitted error limits, is usually demanded to be ± 30%-50% at the confidence level of 50%-70%. These levels, however, is not high enough to allow the application of the modifying factors and conversion of inferred mineral resources to mineral reserves. The study serves as a key document to an investor (or investors) to decide to provide funds for the next stage of the project: the general exploration stage or not. The stage of the exploration phase of mineral projects engaged in general exploration - a process of a more precise outlining of a mineral deposit (primarily roughly outlined during the prospecting stage) with a denser network of exploratory workings including accompanying sampling and sample testing. Consequently, the data obtained is of higher accuracy and confidence levels than in the previous stage. The results achieved during this stage are analyzed and presented by a competent person (or persons): in the geological (general exploration) study and in the following technical-economic (pre-feasibility) study. The main objective of the geological study is a more precise estimation and delineation of an indicated mineral resource, according to the geological data obtained in the general exploration stage. The study should demonstrate that, by further exploration, the indicated resource could be promoted to the measured resource. The main objective of the pre-feasibility study is to prove that, after consideration of modifying factors by a competent person(s), the unmineable indicated mineral resource (usually a part of it) could be converted to the mineable probable reserve. It demonstrates that mining of the latter should have been technically achievable, economically viable and environmentally acceptable. The levels of the accuracy and confidence of the data available are fairly high. As for the resulting pre-feasibility study the accuracy level, expressed by the permitted error limits, is usually demanded to be ± 15-30% at the confidence level of 70-85%. These levels allow the application of the modifying factors and conversion of indicated mineral resources to probable mineral reserves. The study serves as a key document to an investor (or investors) to decide to provide funds for the next stage of the project: the detailed exploration stage or not. The stage of the exploration phase of mineral projects engaged in detailed exploration - a process to the most precise, three-dimensional outlining of a mineral deposit with the densest network of exploratory workings including accompanying sampling and sample testing. Consequently, the data obtained is of the highest accuracy and confidence levels. The results achieved during this stage are analyzed and presented by a competent person (or persons): in the geological (detailed exploration) study and in the following technical-economic (feasibility) study. The main objective of the geological study is the most precise estimation and delineation of a measured mineral resource, according to the geological data obtained in the detailed exploration stage. The main objective of the feasibility study is to justify that, after consideration of modifying factors by a competent person(s), the unmineable measured mineral resource (usually a part of it) could be converted to the mineable proved reserve, extraction of which should have been technically achievable, economically viable and environmentally acceptable. The levels of the accuracy and confidence of the data available are high. As for the resulting feasibility study the accuracy level, expressed by the permitted error limits, is usually demanded to be ± 10-15% at the confidence level of 85-90%. These levels allow the application of the modifying factors and conversion of measured mineral resources to proved mineral reserves. 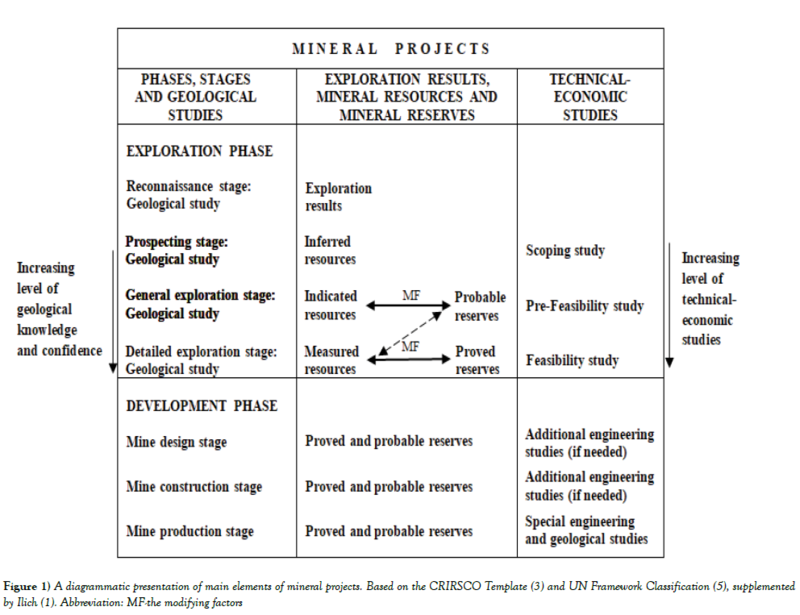 The study, which is based on proved mineral reserves (in some cases a portion of probable reserves could be included), serves as a key document to an investor (or investors) to make a final decision to invest in completion of a project (by performing the consecutive stages of the development phase) or to abandon the project. Although both mineral resources and mineral reserves are estimated and delineated by a competent person there are essential differences in the principles and modes of their estimation. Estimation of mineral resources (inferred, indicated and measured) is based on the geological data obtained directly from a mineral deposit during its exploration and is presented in corresponding geological studies (prospecting, general exploration and detailed exploration ones). For that reason a mineral resource represents a geological category. Estimation of mineral reserves (probable and proved), however, is based on the already established mineral resources (indicated and measured). It is performed by means of technical-economic (pre-feasibility and feasibility) studies that include consideration of the modifying factors and takes into account diluting materials and allowances for losses that could occur during mining and extraction of the belonging mineral raw material. For that reason a mineral reserve represents a technical-economic category: a mineable part of the corresponding mineral resource. The levels of accuracy and confidence of the geological exploration data that could be attained in the prospecting stage are not high enough to allow emloyment of the modifying factors for conversion of inferred mineral resources to mineral reserves. However, the levels are attained in general and detailed exploration stages (see the previous section). Having in mind that the estimation of mineral resources (and reserves as their derivatives) is based on the geological exploration data obtained by interpolation and extrapolation of more or less distant exploration points, on imperfect measurements (containing systematic and random errors) and on subjective geological interpretations, it could be concluded that the estimation should be treated as a principally geological task (not “calculation”‒ as a mostly mathematical task). It is unacceptable to use complex mathematical methods and techniques if the data is not accurate and confident enough. Therefore, the estimates of the resources and related reserves are usually demanded to be within certain accuracy and confidence limits (see the previous section). The use of the geological data, obtained by exploration of mineral deposits, in the scopes of mineral (mining) projects, is considered. It is concluded that the data is a major factor of the assessment whether a project is feasible or not. Of special importance is that about basic characteristics (including their variations) of a deposit being explored and about quantity and quality (i.e. resources and related reserves) of the belonging raw material. In accordance with its significance, the data must have certain levels of accuracy and confidence. The acts which could enhance the levels of accuracy and confidence of the data, in the exploration phase of actual mineral projects, are demonstrated and discussed. Ilic M 2017. Primena rezultata geoloÅ¡kih istraÅ¾ivanja leÅ¾iÅ¡ta cvrstih mineralnih sirovina u rudarstvu (in Serbian, summary in English: Application of Results of Geological Exploration of Solid Mineral Raw Materials in Mining). Tehnika-Rudarstvo, geologija i metalurgija. 2017;71(2):204-11. Ilich M, Vukas R. On the Harmonisation of Serbian classification and accompanying regulations of resources/reserves of solid minerals with the PERC Standards- European Geologist. 2016:26-30.
International Template for the Public Reporting of Exploration Results, Mineral Resources and Mineral Reserves (The CRIRSCO Template) 2013. Pan-European Standard for Reporting of Exploration Results, Mineral Resources and Reserves (The PERC Reporting Standard) 2017. United Nations Framework Classification for Reserves/Resources: Solid Fuels and Mineral Commodities 2009 Fossil Energy and Mineral Reserves and Resources (UNFC-2009).